We believe that every invitation should be as unique as the event it represents. Browse through all the different options you have to truly customize these designs to make them your own. 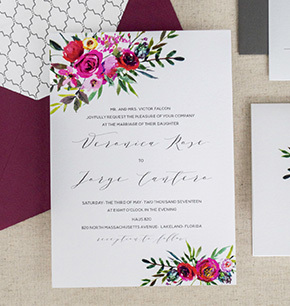 You can switch up fonts, colors, paper colors, invitation size, envelope colors and print methods. At A&P Designs, we offer three different printing methods you can choose from: letterpress, foil stamping, and digital. Letterpress printing is the original form of printing. What began with hand-set wood and metal type used for books and newspapers has modernized into polymer plates which allows modern fonts and designs to be applicable for letterpress printing. Once the plates are made, the printing is done in our antique printing press, fed by hand one piece at a time and one color at a time. All of our inks are mixed by hand, and we mix everything by eye, often matching exactly to a specific Pantone color. Letterpress printing looks great on thicker cardstocks and almost always utilizes 100% cotton paper stock (cotton gives the best impression and holds the ink nicely). Letterpress does have limitations with very dark cardstocks, however, due to the translucent nature of the inks. Foil stamping is somewhat similar to letterpress and engraving, in that the color is applied to paper with pressure. Once the design is finalized, metal dies are created. The dies are heated and then stamped with enough pressure to seal a thin layer of foil to the paper. 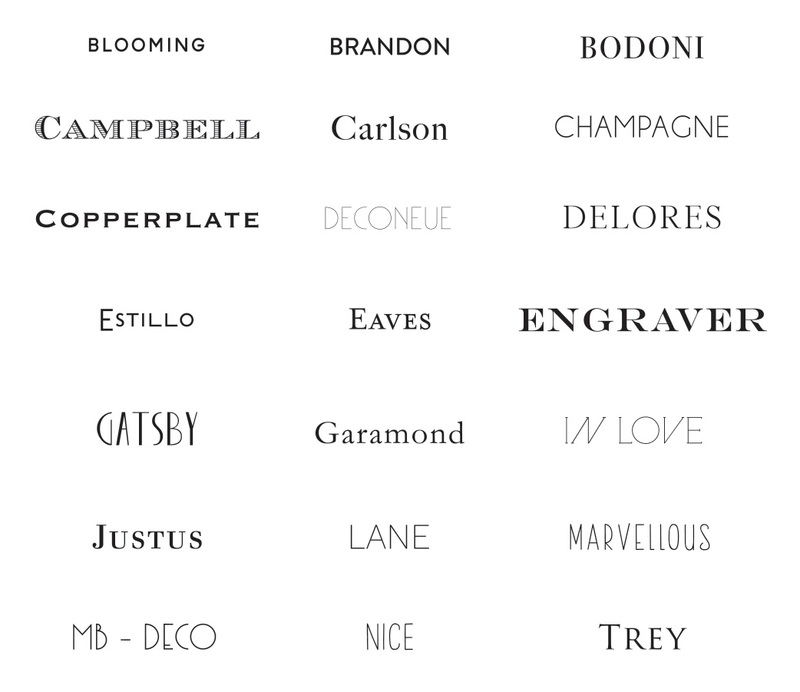 Unlike letterpress, foil stamping is opaque and does not use any translucent ink. As a result, the foil color does not change based on the color of paper on which it is printed. This makes metallic or lighter-colored foils an excellent choice for darker or colored papers. Foil can be used to create a variety of finishes (metallic foils have a shiny, lustrous finish with a big visual impact). 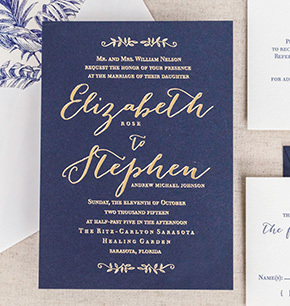 Unlike offset or letterpress printing where printing plates are involved, digitally printed invitations are printed directly from a digital file on a computer. Digital printers transfer four colors of ink (cyan, magenta, yellow, and black) to the paper simultaneously, producing a full-color print after only one pass through the printer – meaning that each invitation takes less time. Unlike letterpress, which leaves a relief impression, digital printing produces a flat image without any texture. Digital printing does have limits. Papers must be able to withstand heat and to go through a curved or straight path in the printer, which means that the variety of paper stock that can be used with this method is more limited than for letterpress and foil. Our house paper is Crane’s Lettra, the best cotton paper engineered for letterpress printing. This paper gives the best impression, holds the ink perfectly and is tree-free, 100% cotton. It has a sturdy, luxurious feel and comes in 1- and 2-ply varieties – white, soft white and ecru. 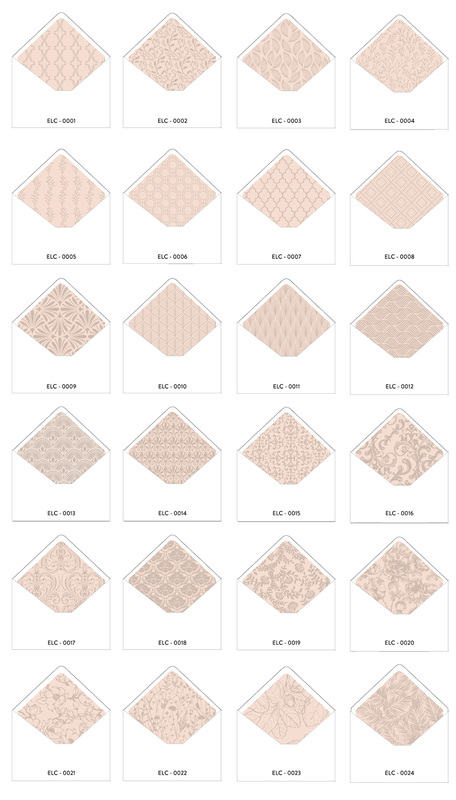 Looking for a colored cardstock? We can accommodate! Just let us know your desired color and we will show you different paper stocks that meet your criteria. If you opt for digitally-printed invitations, we use a beautiful, matte – finish cardstock that comes in either white and soft white. Our standard invitation size is 5×7 with a 1ply cotton paper, but you can chose a larger invitation size or go thicker on your paper stock. Both are great options; just let us know if you want to add this option to your order. 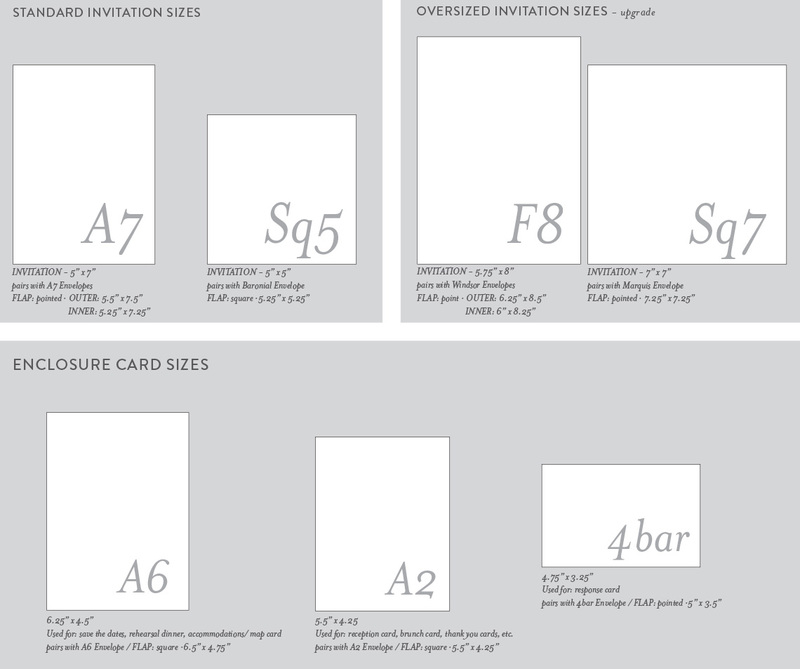 Standard invitation sizes are A7 (5”x7”) and Baronial (5.25” x 5.25”). 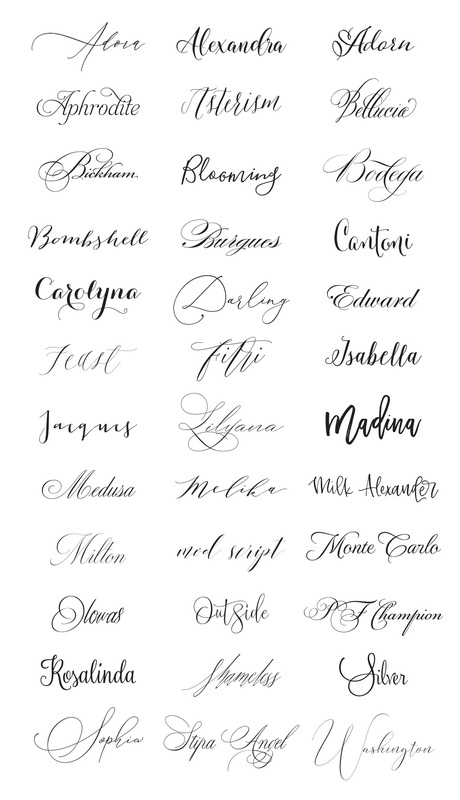 We are happy to customize any of our designs with your choice of ink colors. See below all of our house ink selections. Do you have a certain color in mind? We are happy to custom create any pantone color you can dream up! accurate representations of our ink colors. 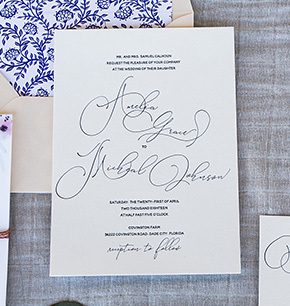 All of our letterpress invitations are paired beautifully with matching 100% cotton envelopes. 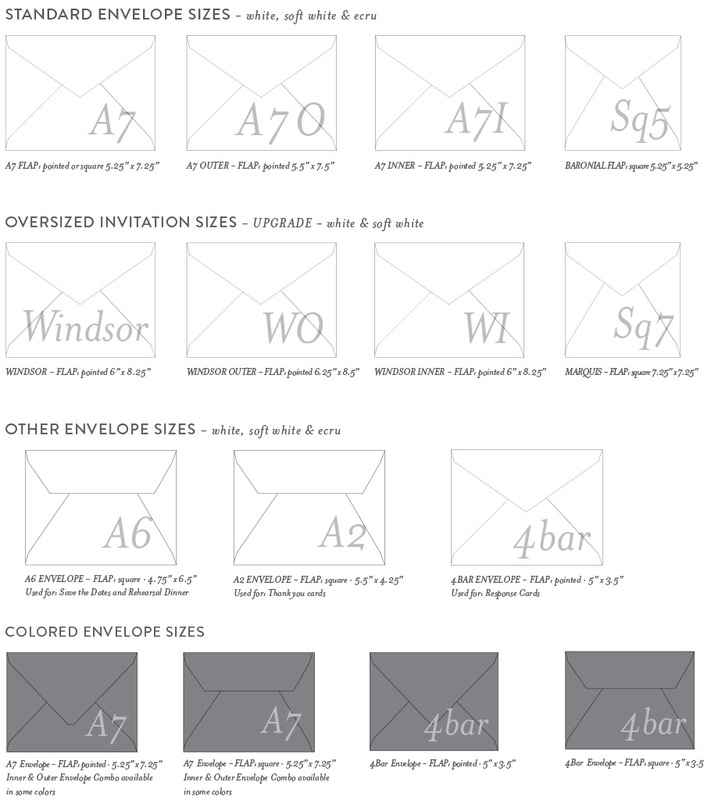 Our standard envelope has a true pointed flap (you can opt for the square flap). Colored envelopes are also available. Most colors come in either the european point flap and square. Please inquire for colored envelopes. Want to add a little color to your suite; maybe a colored envelope is perfect for you. 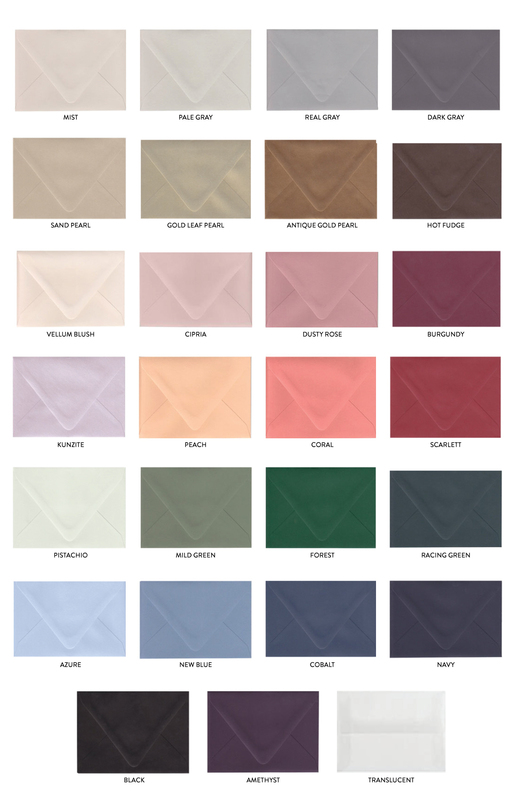 Our standard cotton envelopes have a true pointed flap. The colored envelopes have a Euro rounded flap.